The scent of lavender always brings me back to a rolling hillside in the Bay Area 10 years ago. It was a cool morning. I got out of the subcompact car I had rented and looked around, stretching. The air was full of the scent from thousands of purple flowers everywhere. The flowers crowded the hillside. The butterflies did too fluttering from bud to bloom. Nature was rioting. It was June. I had the day off from training soldiers at a nearby military post in the area. Right off, that means I was relaxed beyond relaxed. It’s the kind of relaxation you do when you’ve had many high-stress days in a row. Days off were few and far between especially with the conflicts in Iraq and Afghanistan. As I remember it, that year, California received a good amount of rain. The weather wasn’t playing the kind of hijinks it has in recent years. The mental visual of the hillside complements any effort I make to use lavender oil for sleep. It always helps to have a visual like that tucked into the memory banks. Several studies show it helps plenty of other people with mild to moderate insomnia as well (Lillehei, Halcón, Savik, et. al., 2015) and (Stevens, Dorsett, DaBell, et. al., 2017). Before taking any kind of a sleeping pill, a whiff of lavender before bed is definitely worth trying. That, and visualizing a field of lavender helps. The scent is available in many different ways. There are aromatic diffusers, candles, bubble bath, soap, dryer bags, and sachets, for starters. Not all seem designed for sleep, but with the ingenuity of people, who knows. Lavender syrup is something you can put on pancakes or ice cream or in a cocktail. Lavender tea, some people swear, helps them with anxiety and helps them go to sleep. It’s pretty wide open how you could use lavender to help you go to sleep. For the studies, they applied essential lavender oil to a cotton pledget and either put it on the subject’s chest or between their pillow and pillowcase. Yet with all of the products available, there are numerous ways one could do it. The key is to visualize relaxation. Imagine yourself on a hillside. 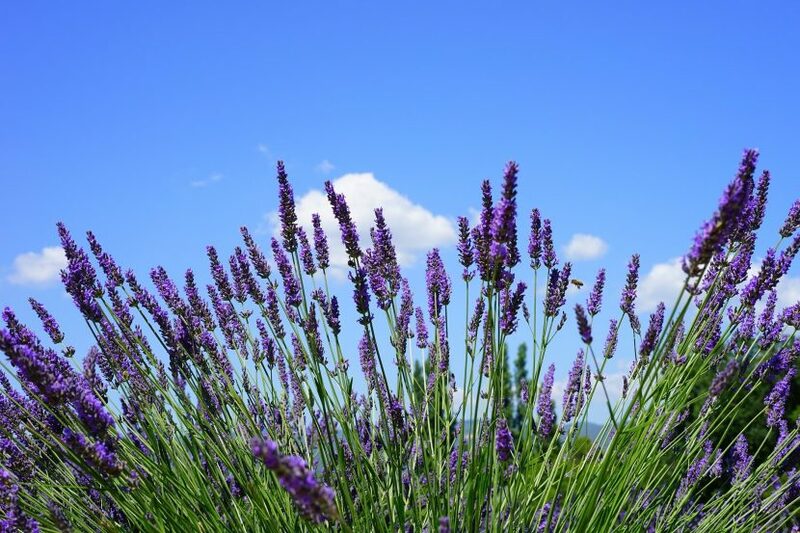 Lavender farms are found on both coasts, though it favors hot, dry climates. There are a lot of different varieties that grow in different climates. Do all that and then inhale deeply. If you’ve never been happy on a lavender-covered hillside, feel free to use your own relaxing image. The Dream Recovery System uses affiliate links and an ad network from which we receive a small renumeration.